Size: 31.7 x 47.5 cms. Die Heylige und Weitberuhumpte Statt Jerusalem erstlich genant Sdlem Genesis 14 vers. 13. This antique view of Jerusalem is almost exactly the same as N Vischer's map from c. 1657 (see Poortman #121) but with German text. 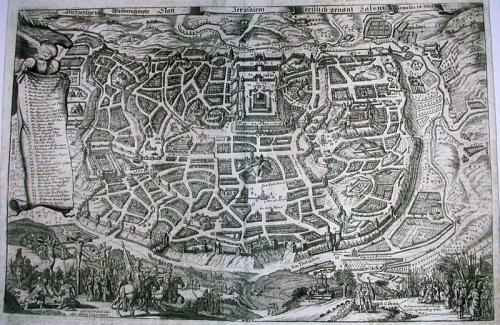 The plan (with north oriented to the left) illustrates the walled city with a key locating all the major sites whose text is placed within a scroll held by an eagle. In the left hand foreground is an illustration of the crucifixion.